Dark circles under the area of the eyes usually appear at a very young age and they considered to be a hardship for both men and women, since most of times cannot be totally covered with the use of make-up. What is the reason of dark circles’ appearance under the eyes? The hollow in the area of lower eyelids, which means that there is a tissue deficit and atrophy of the adipose tissue mainly in the periorbital region. Simply put, the appearance of Dark Circles is not only due to the existence of pigment into the skin but the image is usually very intense simply because there is a hollow formed in the lower eyelids area due to the local atrophy of the adipose tissue. Most of cases the hollow under the eyes is more important than the hyperpigmentation since the shades caused by the hollow can not be covered with make-up. What is the treatment for the dark circles under the eyes? 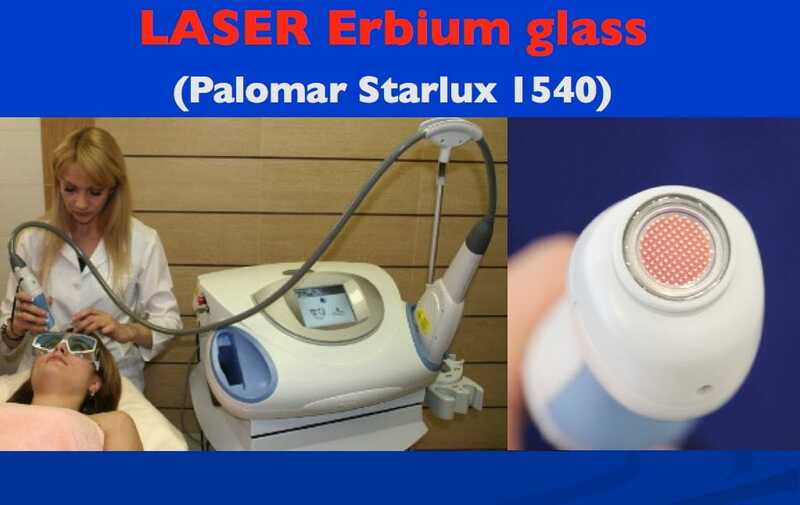 a specialized LASER technology Erbium glass (Palomar Starlux 1540) through we can break the skin barrier creating channels in the dermis of the skin. This way we help the active ingredients of the bleaching cream penetrate into the deeper layers of skin. Applying this combination of techniques we try to reduce the deposition of dark color pigments into the epidermis and dermis of the skin and enlighten the image of the skin. The rate of success of the application of bleaching creams combined with Microdermabrasion -LASER- is quite high. However, we should always have in mind that the skin is a highly dynamic tissue that tends to return to its original state, something that requires a permanent vigilance. Unfortunately, in addition to melanin the appearance of dark circles is also due to the existence of other color pigments or the presence of spider veins or vascular damages which can be difficultly improved with the use of the above techniques. The skin hyperpigmentation is a problem of multifactorial reasons and is also very demanding specifically for the Plastic Surgery and Dermatology. It depends on genetic, hormonal and environmental factors often interacting with each other, a fact that makes it even more intractable. It is considered to be a problem, which can be corrected quite easily achieving a highly aesthetic result thanks to modern injectable implants with the Hyaluronic Acid being the most prevalent among them. Since the major cause of the problem of dark circles under the eyes is the «hollow «of the lower eyelid, if we fill the loss of the atrophic tissue spots points in the periorbital region, then we will simply solve the problem. How can we correct the “hollow” under the dark circles or the lower eyelid bags, using Hyaluronic Acid? In experienced hands the treatment is completely painless, or mildly annoying. It has several technical particularities and it is extremely safe with impressive results. In the area of dark circles and lower eyelid bags we apply a local anesthetic cream for 20-25 minutes in order to avoid pain. 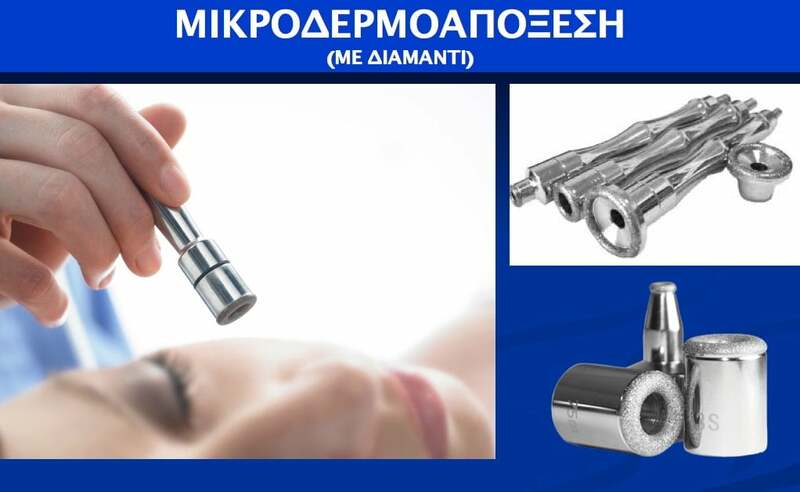 We inject the implant of the Hyaluronic Acid with the help of a very fine needle into certain areas in the infraorbital region, respecting the anatomical features of the region. After the surgery, a slight swelling at the injection sites usually appears and normally the Hyaluronic Acid subsides within 1 or 2 days. In most of the cases, people can cover the swelling with make-up and back to work the next day. The whole procedure takes about 40 minutes. In order to have a complete and perfectly controlled result, it is necessary to repeat the treatment twice within 7-10 days. Is the application of injectable Hyaluronic Acid in the area under the eyes safe? address to a plastic surgeon, who has a great experience and familiarity with those techniques, as well as in-depth knowledge of anatomy. This way we can achieve a completely safe, harmonious and controlled result. Is there any possibility of side effects because of the Hyaluronic Acid? Since the Hyaluronic Acid (molecule wise) is almost similar to that in the human tissues, the injectable Hyaluronic Acid is highly safe. Also the Hyaluronic Acid is not displaceable, thus it remains where it has been implanted, maintaining its desirable result for a long period of time. When the Hyaluronic Acid is properly applied into the tissues, it may cause a slight swelling at the injection sites, which can be appeared untimely. Yet, the swelling subsides easily with the use of simple anti-inflammatory medicine. Another incident that can, scarcely, happen after the injection of Hyaluronic Acid is the appearance of small bruises on the injection sites, which automatically subside within a few days. A very rare side effect of the Hyaluronic Acid that can occur at a rate of 2‰ cases is a mild hypersensivity reaction of the human organism, which is characterized by the appearance of swelling at the injection sites and it can treated by administrating an ANTIDOTE. Is the Hyaluronic Acid the only one implant that has an ANTIDOTE? The Hyaluronic Acid is the only IMPLANT of the contemporary plastic surgery that has an ANTIDOTE. Considering that the Hyaluronic Acid is a glycosaminoglycan, i.e a glycoprotein, there is an enzyme called hyaluronidase, which can break the Hyaluronic Acid down. The ANTIDOTE hyaluronidase is injectable and is found in liquid form, which at any time can degrade and eliminate the implant of Hyaluronic Acid scarce. In addition to other injectable implants, the use of Hyaluronic Acid is ideal since we can reduce the excess quantity of Hyaluronic Acid any time injecting the antidote hyaluronidase into the application sites in order to break the excess material down. The Hyaluronic Acid is broken down by the antidote hyaluronidase and is removed from the human body immediately. 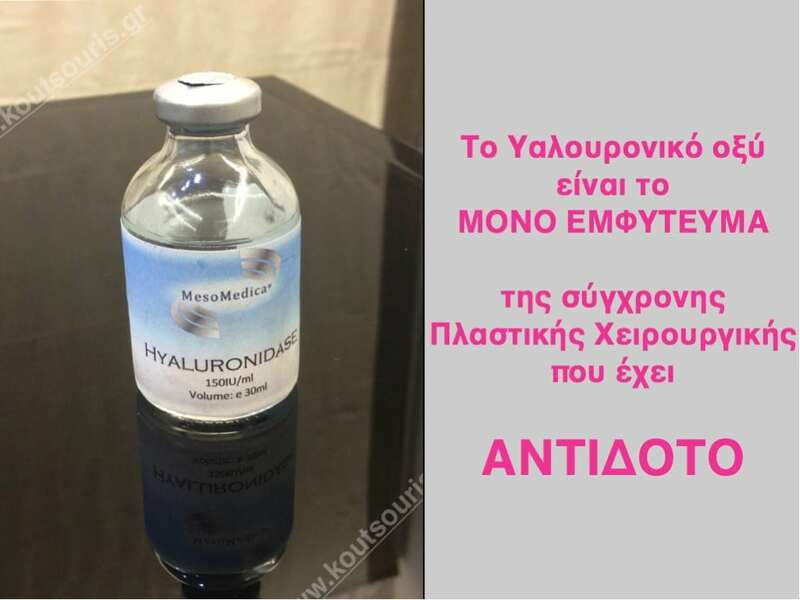 The existence of the Hyaluronic Acid ANTIDOTE makes it UNIQUE, since there is NO OTHER contemporary injectable implant of the plastic surgery with an ANTIDOTE. The antidote hyaluronidase can be used during the application procedure of Hyaluronic Acid, even if an excessive quantity of the material has been misplaced. In any case we can remove the Hyaluronic Acid from the dark circle area in the future. How long the results of the dark circles under the eyes last? 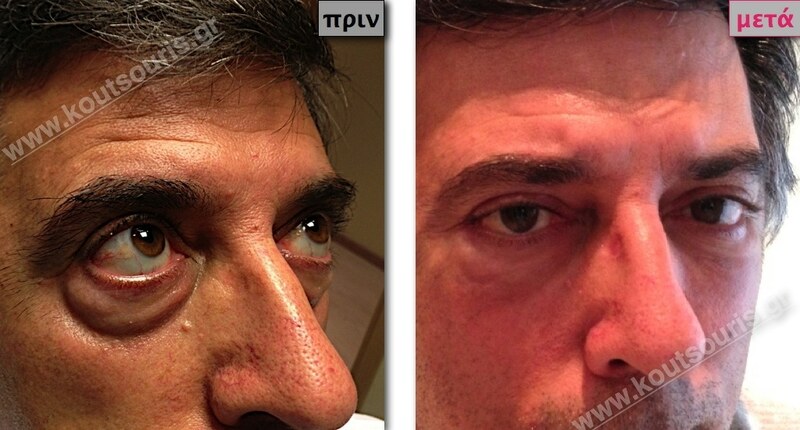 The skin “hollow” treated with filling by injectable Hyaluronic Acid implant. Regarding the skin hyperpigmentation it is required the frequent and meticulous application of bleaching cream, as well as the periodical use of Microdermabrasion and LASER in order to achieve a satisfactory image with the whitening of the periorbital region. 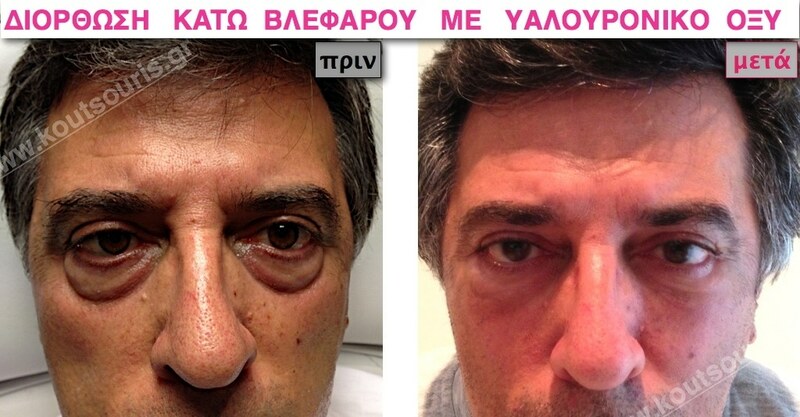 Regarding the “hollow” under the eyes the restoration of this area with the application of injectable Hyaluronic Acid is of long duration since the hyaluronic acid is absorbed in the peri-orbital region at about 15% to 20% within two years. This means that the Hyaluronic Acid, which has been injected into this area, remains stable at about 80%-85%. All we have to do is to refill the 15-20% of the quantity of the Hyaluronic Acid, which has been absorbed, every two years in order to maintain a successful result. Can we intervene and improve the area under the eyes if there are any “eye bags” non-surgically? Using injectable Hyaluronic Acid we can provide solutions to most of people with eye bags. Applying Hyaluronic Acid under the area of the eye bags we can fill the deficit, which usually exists there in order to eliminate the eye bag non-surgically. However, in case of big eye bags the only solution is surgery.